Today I have the fabulous Eugenia to inspire you who embraces grace, elegance and classic style. Let’s find out more about her! I am a wife and mother. My husband and I celebrated 30 years of marriage in 2014. I have two adult children, a daughter and son. I’ve worked in the pharmaceutical industry for nearly 18 years, so I have a great concern for health awareness especially as it pertains to women of a certain age. I am moving out of the 50s this September. Can you tell us a bit more about your blog, The Age of Grace and why you created it? 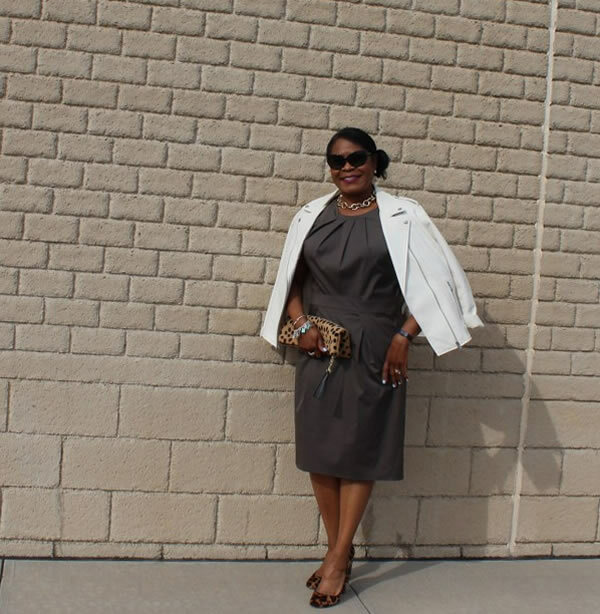 I created The Age of Grace in January 2013 to connect with other women who are/are not aging gracefully, maintaining healthy weight while being stylish. I would say feminine and classic style. I enjoy my feminine side. I am a girly girl. I love wearing skirts and dresses. I grew up watching my mother and grandmother wear hats and gloves. In addition, I grew up attending school where one had to wear a uniform everyday. I love the opportunity to express myself. Finally, I believe the accessories (necklaces, belts, and shoes) really can make a difference for any outfit. 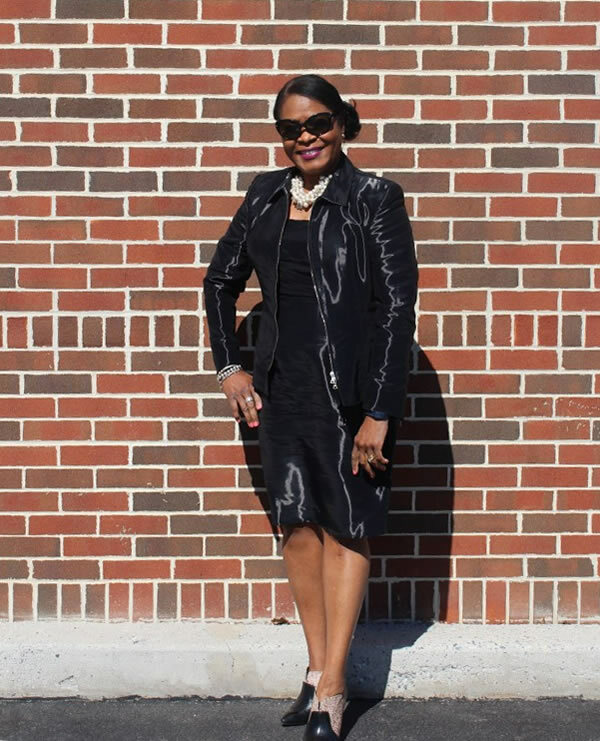 Since I started blogging, I see that sunglasses easily elevate your style and sophistication. There’s something cool about sunglasses! Where do you live and does that influence your style? Currently, I live in small town USA, Central Pennsylvania but grew up in a major metropolitan area, Philadelphia, Pennsylvania. I don’t believe the area influences my style. Although for work, I do dress very conservative with just a little flair of me. Classic and elegant. I am not afraid to get dolled up. I am not really a jeans and t-shirt kind of girl. I am inspired by other bloggers, fashion photos on Instagram, fashion magazine ads, and fashion articles. While still working with what works for my body type. I’d like to believe I am not a slave to fashion. I think your tagline fits me, “Because style only get better with age.” I have always been interested in fashion, style and the way I look. What I think has changed is I dress for my body type that has make a big difference in how I look in what I wear. I attended charm school early in my teens. I recall lessons on being a lady, acting like a lady and dressing like a lady as reinforced by my parents and grandparents. I know this early lesson in life still impacts me. I believe how I look is important now because of the age I am currently, the industry I work in and wanting a piece of the blogging revenue opportunities. 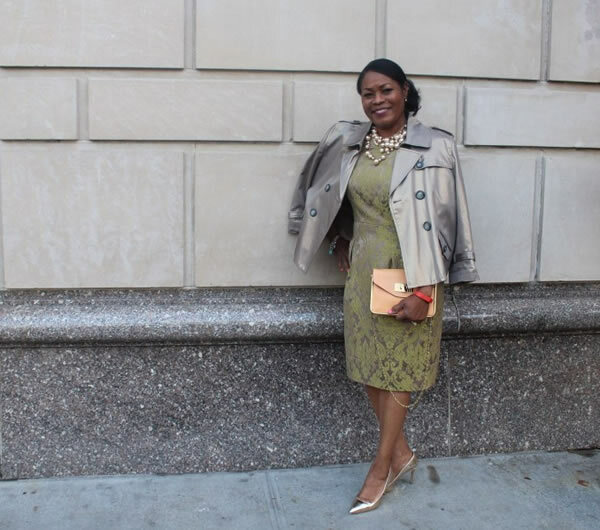 Women over 40 + can and do make contributions to style and fashion. 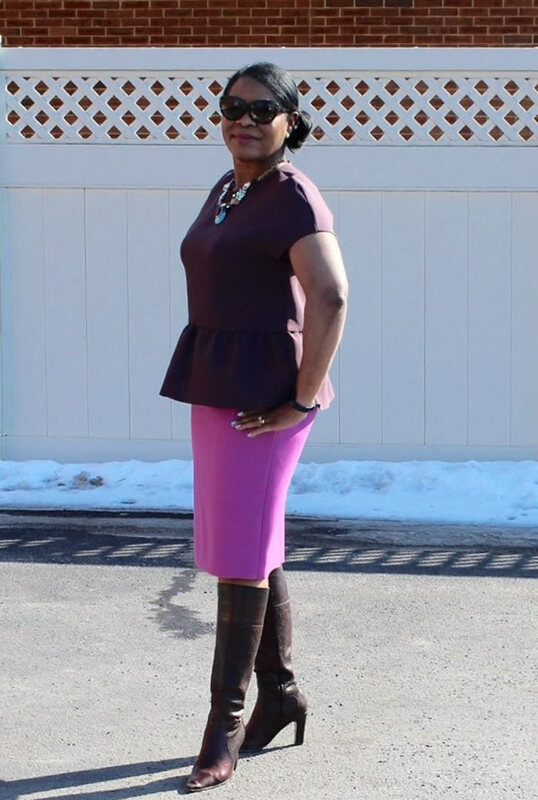 Which of the outfits on your blog are personal favorites and why? I like my pink suit. I discovered my own hidden gem (the pink suit) in my own cedar closet. 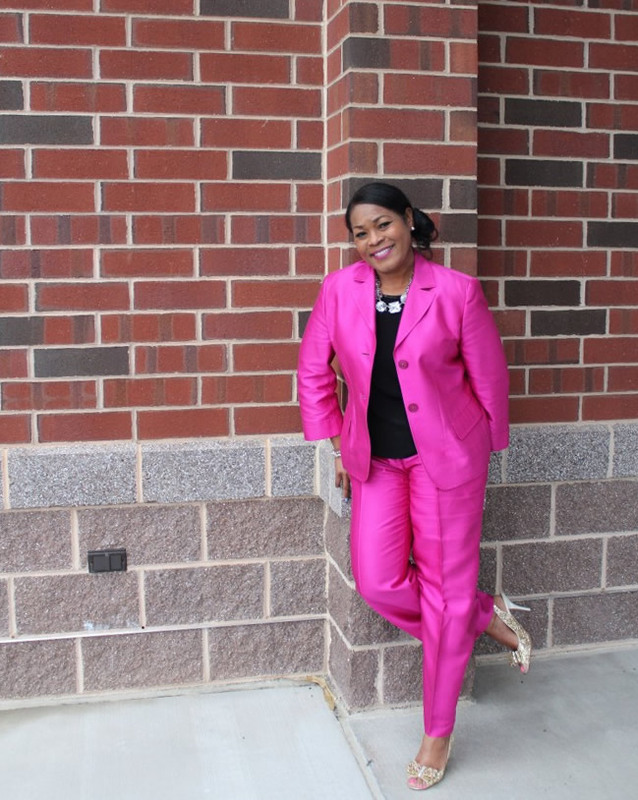 I love pink and this suit is a great color for me. I live in an older home with small closets. I rotate my clothing each season in and out of my cedar closet on another floor. I realized I had some great things that I can still wear because I maintain the same size. I utilize the Fitbit to track 10,000 steps per day. I also like the white outfit. I put together a few pieces, some old and new. I like to mix something new with what I already have in my closet. I also like this one where I put on a hat pushed down over my eyes. I have found as I have gotten older, I am not afraid to play with style and have fun. My daughter calls me a drama queen! The photo where I am wearing animal print skirt with bright orange blouse and I draped one of my capes over it also really appeals. Old pieces brought to life! It’s easy when a jacket matches a skirt or dress, the real style comes when you can put pieces together to make a statement. I’ve also learned not to be matchy-matchy. I find outfits to be more interesting when it doesn’t look like you just purchased everything off a mannequin. Dress your body type and find you down personal signature style. 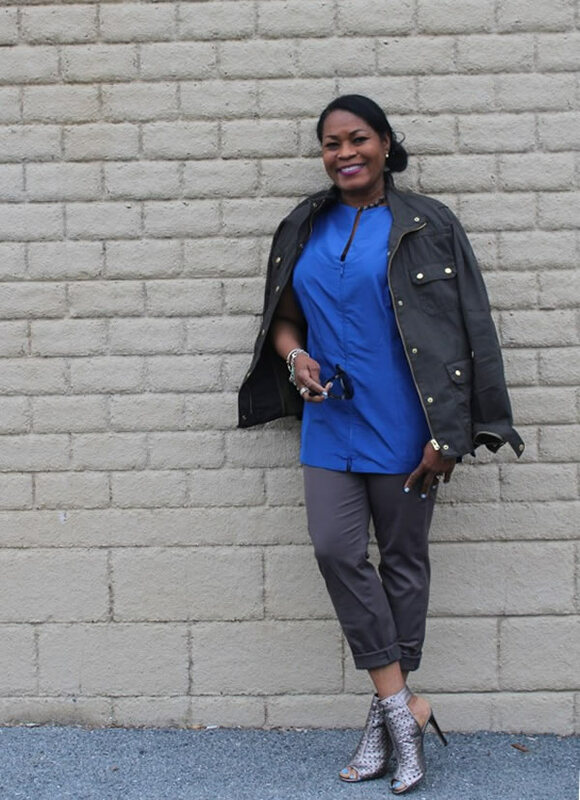 My goal for my blog is to connect with more women to inspire them to lead healthy lives while maintaining great style. 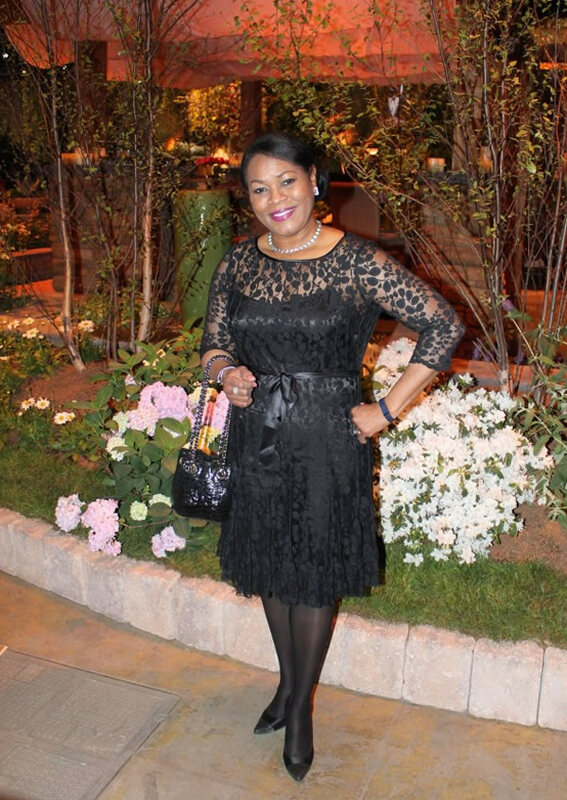 And to continue to find more women to feature on the blog, who epitomize style, health and faith. 80% of my blog photos are taken my me. In taking the majority of photos, I know what angle, poses and outfits work for me. I am scheduled to take a photography class in May. In addition, I plan to take a writing class as well. I am acquiring a collection of capes. That’s where my drama comes in. 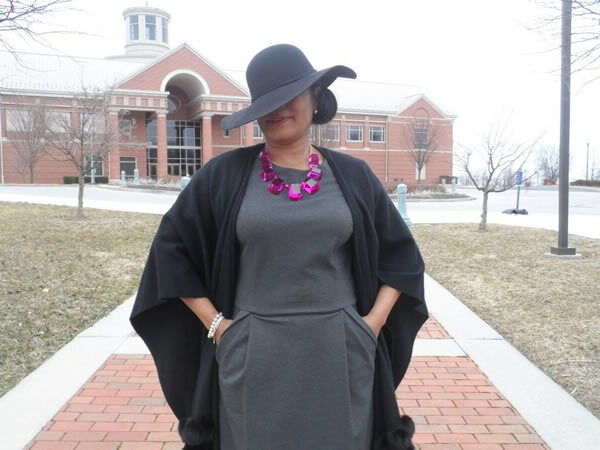 A cape serves so many purposes, can be a wrap, put over a dress or gown, over a dinner suit. Finally, I like to watch the black and white movies. The ultimate style and elegance is expressed in just about every one of these films. I am positive this overlaps into my dressing style. Thank you so much Eugenia! 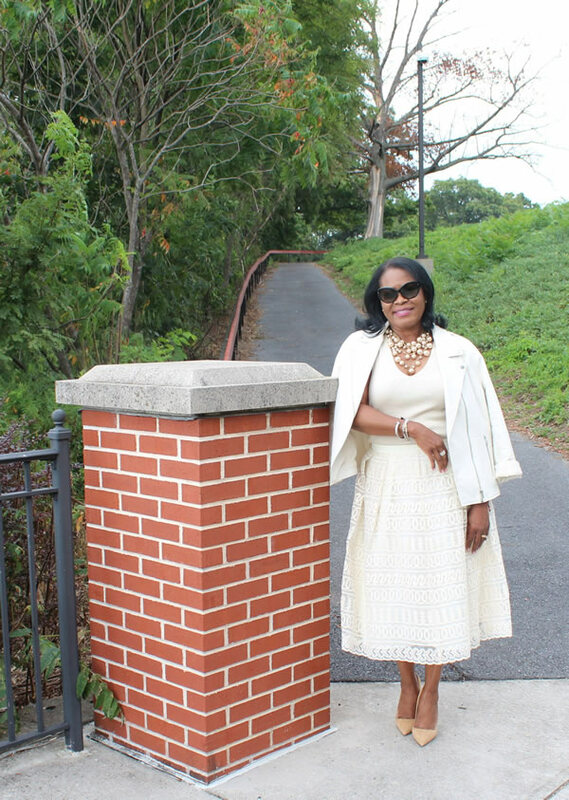 Be sure to check out her fabulous blog: The Age of Grace. Which of Eugenia’s outfits is your favorite? Lovely, She has great style! Gorgeous – so elegant – I love her use of color! She is gorgeous, classy and tasteful!!! Great article on Age of Grace-I read her blog regularly!!! She is gorgeous and a fabulous friend to me. I am inspired by her style and I like the first and second picture. Love Eugenia’s classic elegant looks and use of color. Silver booties – wow! Her beautiful smile is the best accessory. That is too hard to say. I love 90% and like 10%. Although she dresses different from me, I recognise myself in her. Strange isn’t it? OK the pink suit is terrific. Also because it shows her confidence. I now follow Eugenia on IG. She has a really good sense of styling. Eugenia demonstrates class & style in a very gracious manner. Thank you for introducing her to me. I love her! I’m biased, though, she’s my mom. What a great feature and I enjoyed visiting your blog. Wow! She looks wonderful. She definitely knows how to dress for her shape and look stunning! 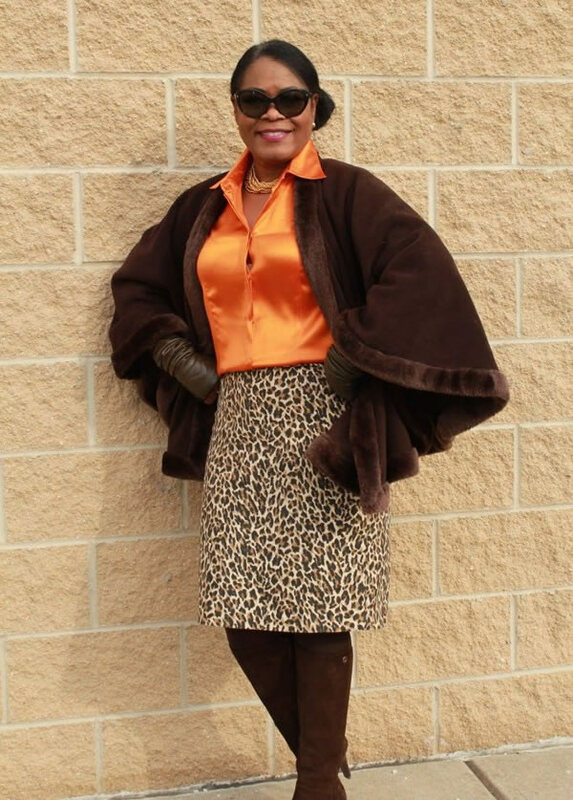 I am a 50+ African American women and dresses with class like she does!! Eugenia is a classy lady! I love that her outfits are feminine and classic, yet bold, with some color and prints mixes. And that playful hat on her eyes, oh that’s just great! Previous post: How I wore both my black and white leggings on holiday!